Series Editors: Moira Stewart, Judith Belle Brown and Thomas R Freeman As the population in western cultures ages, more people suffer chronic, ultimately life-limiting diseases and medical professionals need to be equipped to cope with the ever growing pressure of palliative care. This book gives guidance on how to approach patients with life limiting illness. While the problems most people present to the doctor appear relatively straightforward, a whole person approach to understanding the complex interaction between the person, their illness and their environment should lead to a more complete consideration of the illness and better health outcomes. For issues of palliative care, such an approach is essential to identify and meet the many needs of desperately ill people. Palliative Care offers a fresh look at the management of patients. 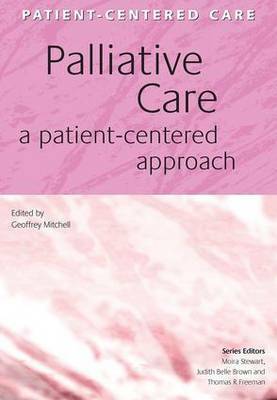 With international, evidence-based contributions, the book suggests practical and challenging ways to care for the dying. It is ideal for all healthcare professionals working in palliative care, General Practitioners and medicine and healthcare students.